I hope you answer my even if you can't give me direction. Blesssings always. It has been a while since I checked out what you have been doing. I am pleased to see that you are holding the kutalicious class in October, I will be there. I would love to be the lucky person to do a resin course. I will keep my fingers crossed. 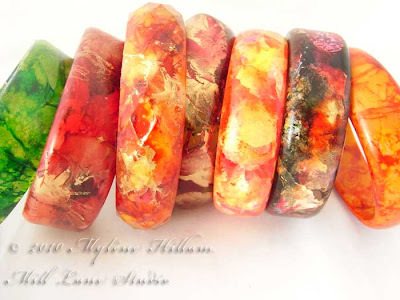 love your work, you creat the most beautiful and amazing bangles with resin. I'd love to dop one of your classes as I find it hard to buy bangles that I can actally get over my hand. Happy blogiversary! Your work is always beautiful and your talent to create and teach is amazing. Any workshop with you would be a blessing to whomever attended. Your blog is always so interesting to read thru. Love your work and the ideas you come up with are amazing. I'd certainly LOVE to do a resin workshop Mylene, just a bub to have first and then see if I can sneak away for few days crafting R&R! :-) Good luck everyone! A resin class is on my must do list so I would love to win one Mylene! You know I would love to do one of your workshops, you being a Star International Winner and Teacher. It would give me a chance to catch up as well. You are one of the most talented jewellery and papercraft artist I know. Hope you are keeping well. I'm so delighted to see that you are doing resin workshops in Brisbane. I've only played with a little bit of resin, and am intrigued to see what more it can do. The next door neighbour's son thinks I am a craft guru - he's trying to make a resin clock for school assignment. So I would be delighted to attend one of your resin workshops in Brissie. I would be thrilled to win the chance to attend one of your Resin Workshops. I have been wanting to give this a try for some time now and this would be the perfect opportunity. I've only just discovered your blog when doing a search for friendly plastic as it sounded interesting. I was amazed to find a local artist of your calibre. It is so generous of you to offer this course and I would be thrilled to be able to attend one of your classes. Karla Mac Donald - My well-worn crystal ball tells me that Mylene's gift certificate has MYYYYY name on it (it better be right this time)! Sara Feeny-Marks - Oooh, now wouldn't that be fab eh?! Your workshop sounds great, resin is a gorgeous medium I'd like to try working with. Nothing like it that I can find in NZ so I'm coming over to do a course asap. See you soon. I'd love to have you come join me for a workshop SuesNZ. Hope to see you soon!